“Our struggle for #democracy, #solidarity and #commons is also explicitly directed against a right-wing populist Euro-criticism.”, said spokesman Hanno Bruchmann. In addition to the protests against the ECB opening there will be decentralized days of action in May 2014. On a local level initiatives shall create a connection between their local struggles and the European crisis policy and try to build up a strong network between each other. “We are creating a coordination structure for the planning of common, decentralized actions. This actually opens Blockupy up in favor of a real perspective of transnational movement and thus to a new quality.”, said Neva Cocchi of meltingpot.org from Italy after the conference. The international Blockupy Alliance is supported by many different groups, individuals and organizations from all over Europe. 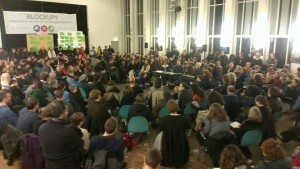 Neva Cocchi and other activists from all over Europe represent a significant transnationalization process of Blockupy. With a blockade of the ECB, civil-disobedient actions across the city and a large, colorful demonstration Blockupy-activists set a clear signal against the impoverishment policies of the Troika already for the second time in June this year. In contrast to this violent and obviously politically motivated actions by the police took place in order to undermine the right of freedom to demonstrate.